The editor is a simple web coding tool divided in 2 columns. 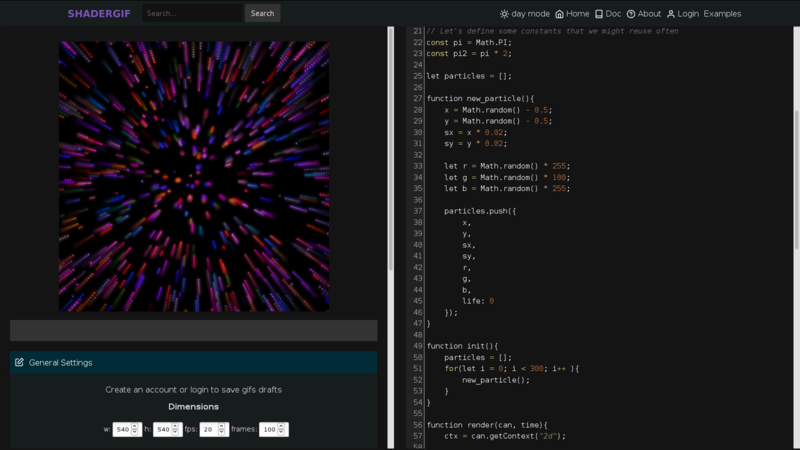 Left: a visual preview + tools to generate gifs. 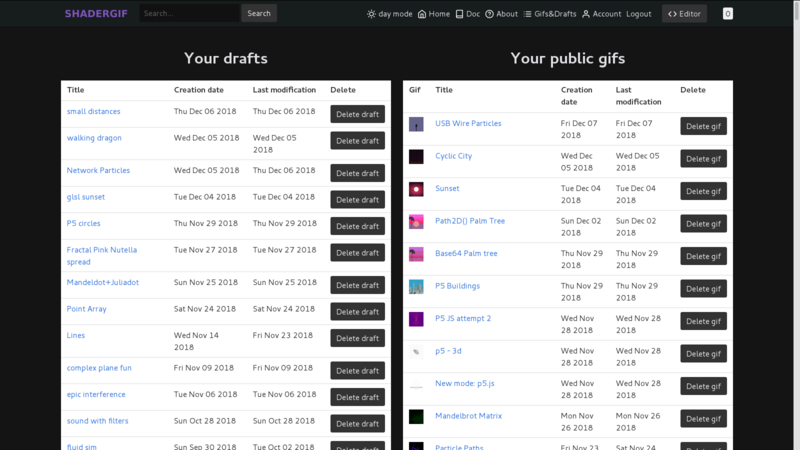 Use your favorite editor - Download standalone offline copy to edit with your favorite editor. Everything that can be done in your browser is free. Since ShaderGif is open source, you can always download the code and run it on your own hardware. Registering allows you to publish gifs on the feed and save drafts for later. The editor contains a preview at the left and the code at the right. Pro tip: The various panels at the left can be collapsed by clicking on the title bar. To create gifs, there is a "+ Create gif" button. Be patient, since this process takes some time. How to get all frames as png? Click the "Create .zip file" button. Then, in the shader editor, click the "Create gif" button. The encoding will take a few seconds. Once it's ready, the gif will appear at the bottom of the left division of the screen. The uploading will take a few seconds, it's normal. The server is rendering a video preview of the gif for the feed. There are 104 registered users and a total of 375 shared gifs . With an account, you can post public gifs and save drafts.